HomeNew BikesBike NewsIs The Next-Gen Small Ninja Going To Be Electric? Is The Next-Gen Small Ninja Going To Be Electric? It seems inevitable that almost everything on wheels will shortly go electric -- including what’s probably the most beloved small-capacity sportsbike of the last decade. Kawasaki could also be working on swappable lithium ion batteries. All the Japanese Big Four -- Honda, Suzuki, Yamaha and Kawasaki -- are hard at work developing alternative energy-powered motorcycles. The shift from petrol to electricity is inevitable with bikemakers gearing up for electrification. And Kawasaki is no exception. The Japanese bikemaker has been looking to build a zero-emission motorcycle for a long time now. But which model will be electrified first? Well, we may have the answer to that. 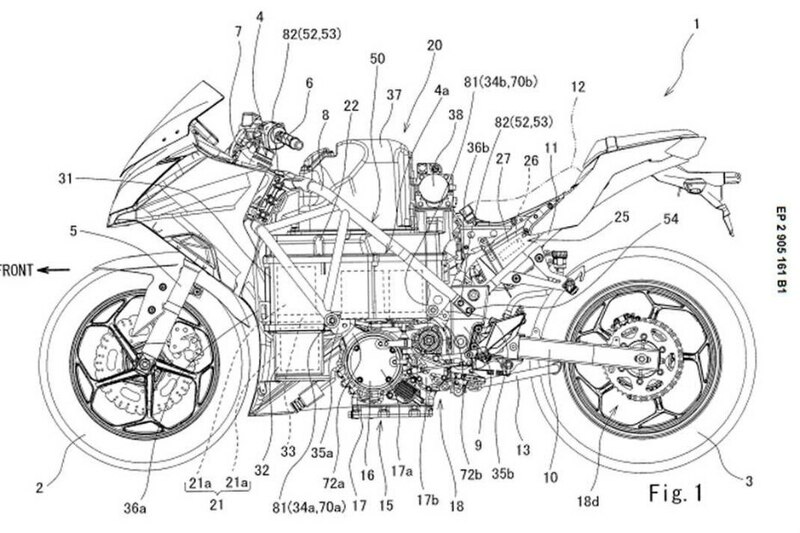 As per the new patent images, Kawasaki is shown using the Ninja 300 as the test bed for its electric powertrain. The patent was filed in 2013, so it is unlikely that the blueprint is of the Ninja 400, as it was launched in 2018. Rather than developing a new frame, Kawasaki is using a tubular frame. The documents also show that the motorcycle is using a swappable lithium ion battery pack. The idea is to replace the depleted battery pack with the new one by removing a portion of the frame. Kawasaki is already working on this technology in partnership with Honda, Suzuki and Yamaha. If Kawasaki decides to fit an electric powertrain on one of its entry-level motorcycles, we would really like it to be the Ninja 400 because of its far superior dynamic abilities than the Ninja 300. Also, the Ninja 400’s frame is much lighter, which could lower the overall weight of the bike.